Fallout 3 is an action role-playing open world video game developed by Bethesda Game Studios. It is the third major installment in the Fallout series. 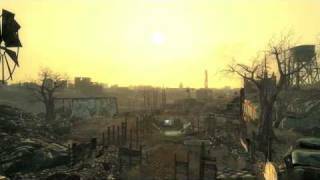 Fallout 3 takes place in the year 2277, 36 years after the setting of Fallout 2 and 200 years after the nuclear apocalypse that devastated the game’s world in a future where international conflicts between the USA and China culminated in a Sino-American war in 2077, due to the scarcity of petroleum reserves that ran the economies of both countries. The player character is an inhabitant of Vault 101, a survival shelter designed to protect up to 1,000 humans from the nuclear fallout. When the player character’s father disappears under mysterious circumstances, the Overseer, or the leader of the vault, goes insane, and sends security forces after the player, who is forced to escape from the Vault and journey into the ruins of Washington, D.C. to track him down. Along the way the player is assisted by a number of human survivors and must battle a myriad of enemies that inhabit the area now known as the “Capital Wasteland“. The game has an attribute and combat system typical of an action strategy game. Following its release, Fallout 3 was well received by critics and received a number of Game of the Year awards, praising the game’s open-ended gameplay and flexible character-leveling system. The NPD Group estimated that Fallout 3 sold over 610,000 units during its initial month of release in October 2008, performing better than Bethesda Softworks’ previous game The Elder Scrolls IV: Oblivion, which sold nearly 500,000 units in its first month. The game has also received post-launch support with Bethesda releasing five downloadable add-ons. The game received controversy upon release, including the use of morphine in the game for Australia, religious and cultural sentiments in India, and sensitivity in Japan due to a mission involving the detonation of an atomic bomb. The introductory sequence introduces the player to their character’s father James, a doctor and scientist in Vault 101. James frequently makes comments about the player character’s deceased mother Catherine, and her favorite Bible passage, Revelation 21:6, which speaks of “the waters of life”.